But you might be stuck on what to create. You might be paralyzed by either having so many things to talk about and/or not know what the hell to talk about. Regarding the latter, I want to say that you do have a LOT to talk about. Actually, I know that you are sitting on a goldmine of content. I’ll help you discover that goldmine and show you how you can take what you find there and recycle and repurpose it for the same platform or different platform (like a blog post, a video, or a social media post). 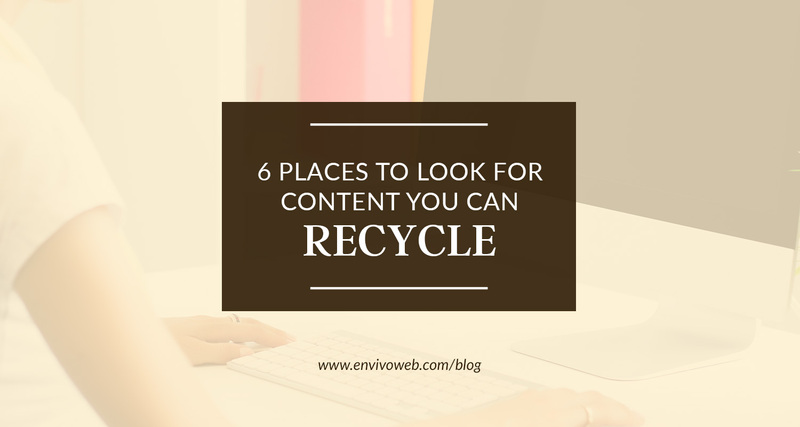 Here are 6 different places to look for content that you can revive or reuse for your online marketing. Have you ever given a talk at an event? Even a 5 minute talk? Or maybe you host webinars in the past. Look at the presentations you’ve created: the script, the outline, the slides, etc. If you have a script written out, take out a couple paragraphs, re-write it a bit so it makes sense as a standalone post, and post it on social media! Easy peasy. Or you can take out a larger chunk and turn it into a blog post. You haven’t created anything from scratch. You just took something you already created, reformatted it, and shared it with your audience again and in a different area. It feels like almost all of my clients have come to me having old courses or programs just sitting on their computer collecting dust. You might have this, too. Maybe you ran a 3 hour workshop or a 4 week program in the past but aren’t actively running that program anymore. Take a look at the scripts, presentations, and supporting materials you made for the course. What can you make out of it? Maybe you can take a piece of the script and turn it into a blog post. Take a slide out of the presentation and make a graphic to post on social media. If you created a workbook for a course but no longer teach it or sell it, turn it into a lead magnet! Of course, you want to respect those who did pay for your program. I recommend recycling by just taking a small piece of the program and reformatting it so it can be a standalone piece of content. You can even take it a step further and sell it. If it’s still relevant to your brand and audience, the first thing you can do is bring it back and offer it again. But if you don’t have the time or resources to spend setting it up as an opt-in, you can take a piece of it and make it a social media post or a blog post. For example, I have an eBook that used to be my main lead magnet: 5 Free Online Marketing Tactics that Will Grow Your Audience. One of the strategies I talk about is getting featured on someone else’s platform. I can take a paragraph out of that, re-write it a tad, and boom: social media post. Or I can take multiple paragraphs and make it a blog post. Don’t be quick to dismiss your old lead magnets that aren’t relevant to your business anymore since you have evolved. Go take a look at it. You may find that a piece of it can be re-worked just a bit so that it’s relevant to where your business is now. Are you live streaming on Facebook, Instagram, Periscope, or YouTube? That’s very valuable content! Take the livestream from one platform and post it on the other. Make sure you go back and look at your older livestreams. You can certainly crosspost those. You can even take a clip from one of those videos and turn that into a post of its own. Look at your social media analytics from 6-12 months ago. Was there a post that got a lot of engagement? Why not post it again? Most people might be seeing it for the first time. Some may see it again but the likelihood of them having a negative reaction is very little. They may even learn something new because as you see something multiple times, your understanding of it is stronger and your memory of it is stronger. This one is for you if you used to run a completely different business. Take a look at that business and compare it to your current one. It might be related to your current business in a small and specific way. I have a client who used to be a health coach and is now a business lifestyle coach for entrepreneurs. She can take some content from her old health coaching blog and refresh it in a way that is relevant to her new audience. She teaches entrepreneurs how to have a fulfilling business and life. That involves having good health. If after reading this post, you have some ideas on a piece of content to create, share your idea with me! It doesn’t need to be done. Either tell me about the idea in the comments below or “Like” my Facebook page and send me a message there. I’d love to hear from you and see what you’re inspired to recycle and recreate!